“Thankfully, the election has come and gone without any major violence, which the APC apparently craved for because of their fear of losing on the day. While nobody should begrudge Aregbesola and his party their victory at the polls, it is certainly worth remembering that the monumental success the election turned out to be was the result of the commitment of one man to the sanctity of the electoral process. One of the cardinal issues in President Jonathan’s transformation agenda is electoral reform“. THE build-up to the Osun State gubernatorial election was very frightening to all peace loving citizens not only in the state but across the country. The party in government, the All Progressives Congress (APC) approached this election with a matter-of-life-and-death mentality. Even more so, the national leadership of the party saw the election as a win or burst situation. With the trouncing the Peoples Democratic Party (PDP) gave them recently in Ekiti State, the leading opposition party in the country, APC, wittingly or unwittingly concluded that another nosebleed in Osun would portend, in finality, the decimation of the party even before the big one in 2015. No wonder then that the incumbent governor, Rauf Aregbesola with the leadership of his party employed all the tricks in the book in fighting the election. They threatened, cajoled, induced and unleashed all manner of propaganda. They accused the Independent National Electoral Commission (INEC) of bias towards the PDP. They accused the election management body of releasing ballot papers to PDP members beforehand. They kept “uncovering” one plot or another geared towards compromising the election. At some point, it seemed more like INEC was spending more time responding and debunking the APC allegations than planning to get it right in the Osun gubernatorial election. Predictably, President Goodluck Jonathan in particular was the main target of the APC serial lies and propaganda blitzkrieg. The President was accused of “militarizing” Osun State in order to intimidate the people who are all presumably APC voters and to pave the way for his party members to rig the election. In an unstatesmanlike manner, the APC leadership, as always, continued to demean the office of the President by calling Jonathan all kinds of names just because of an election. Thankfully, the election has come and gone without any major violence, which the APC apparently craved for because of their fear of losing on the day. While nobody should begrudge Aregbesola and his party their victory at the polls, it is certainly worth remembering that the monumental success the election turned out to be was the result of the commitment of one man to the sanctity of the electoral process. One of the cardinal issues in President Jonathan’s transformation agenda is electoral reform. Remember that on the road in 2011 when he was campaigning for the office of president, he promised Nigerians that if elected he would restore dignity and honesty to our elections as a vehicle for expressing the popular will. He was loud and clear that the era in which elections do not reflect the political preferences of voters will not be part of the testimonial of his presidency. And to be fair, he really showed his hand early in the day as a strong democrat by telling his party men and women that his ambition is never worth the blood of anybody. From the “do-or-die” mentality of the past, evidently there is a paradigm shift under Jonathan pointing to one man-one vote! And in disinfecting the electoral process, President Jonathan was correct in his prognosis that lack of adequate security during elections remains a surmountable impediment to free and fair election. In the past, we were all witnesses to shootings and all kinds of brigandage at polling booths. We also heard and read stories of ballot box snatching and ballot box stuffing and all manner of untoward events that corrupted elections across the land. These are apart from some personnel and the leadership of INEC that did not inspire any public confidence in their ability to make the votes count. The President has admirably banished all those concerns about electoral integrity. First against his own interests, he identified and appointed a man historically linked with the opposition in the country as the head of election management body, INEC. Prof. Atahiru Jega, the INEC chairman, is a happy member of the civil society and a foremost labour leader whose place is assured when the history of democratic struggles in Nigeria will be chronicled. Jega has not only rejigged the operational strategy of INEC for greater effectiveness but more importantly he enjoys the independence, which was alien to his predecessors. Beyond President Jonathan’s commendable neutrality in electoral matters, he has raised the bar by ensuring that the secured ambience for conducting elections is ever so evident since he assumed office and not even the opposition can deny this. From Edo State to Ondo State through Anambra State, and from Ekiti to Osun State, Jonathan has shown himself a statesman and leader to be trusted by the way he ensured that the common people are protected to cast their votes for the candidates of their choice without any fear and intimidation. Those hurling allegations of tyranny against him in the APC would have used this privileged position to the advantage of their party if their track record is anything to go by. The APC leadership and particularly their governors unlike Jonathan, who had never interfered with INEC, have basically turned their States’ Electoral Commissions as mere parastatals of their governments. In Lagos, Fashola used the LASIEC to conduct what has remained the most atrocious local government election in Nigerian history. As if to outdo their Lagos counterpart, Rabiu Kwankwaso of Kano and Adams Oshiomhole of Edo among other APC governors gave away their lip-service commitment to democracy with shameful local government elections they supervised in their various states. Yet these are progressives! It is dishonourable and hypocritical for people like Governor Fashola of Lagos State and, in indeed, all APC governors to seek to change the narrative of the Osun gubernatorial election from the commitment of President Jonathan to electoral integrity to some phoney “victory of the people against the forces of repression.” The APC won the election in Osun State because there is a sitting President who cares more for the rights of the Nigerian citizens than the interests of his own political party. That was the reason President Jonathan kept his word by deploying adequate law enforcement agents to Osun State during the election. Now, it is clear that Jonathan has nothing to prove to the Nigerian people again when it comes to his commitment to electoral integrity. He did it in Edo State, and APC was the beneficiary. He did it in Ondo State with Labour Party being the beneficiary. He did in Anambra, and the All Progressives Grand Alliance (APGA) was the beneficiary. He did it in Ekiti State where the PDP was for the first time, the beneficiary. 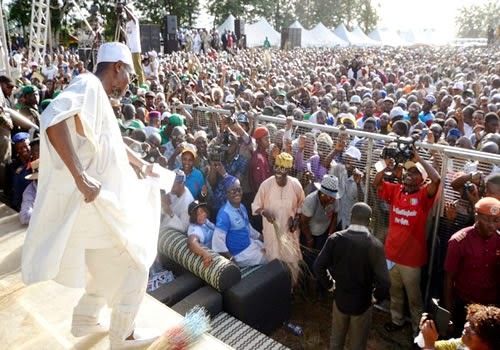 He has just done it in Osun State with the APC benefitting again. He will do it again in 2015 for the Nigeria people. • Ainofenokhai contributed this piece from Benin City.